Software has been an important part of research for several decades, and ensuring that research software is of high quality is essential to ensuring the accuracy of scientific results. Unfortunately, many people who work on source code used on research projects have lost themselves in the gap between IT professional and researcher, lacking a distinct professional identity, at least until relatively recently. It was four years ago that the term Research Software Engineer was born at the Collaborations Workshop 2012. In this short time, many researchers have heard this term and experienced an epiphany: they found an identity. Now they have more than an identity; they have a community. On Thursday 15 September and Friday 16 September 2016, the first ever Research Software Engineer Conference was held in Manchester at the Museum of Science and Industry. More than two hundred people attended from across the globe. Not all of the attendees were Research Software Engineers; some came to learn about building communities for analogous roles, some came to share their struggle, others came still identifying as researchers. The spectrum was frequently mentioned; researcher at one end, software engineer at the other and Research Software Engineers somewhere in the middle. In his keynote presentation, Matthew Johnson from Microsoft Research introduced the idea of “little-r” (those who do little research) or “big-R” (those who do lots of research) software engineers. The key point is that this role bridges the research and software engineering disciplines. Simon Hettrick has already written about the conference on this blog but we, as Software Sustainability Institute Fellows, wanted to share some of our highlights. The fact that this was the first ever Research Software Engineer Conference was not obvious from the varied and interesting programme put together by the organising committee. We were treated to thought-provoking talks, horizon-expanding tutorials and enthusiastic discussions. The workshops and small talk sessions were run in parallel with five options to choose from. There was an eagerness during coffee breaks to find out what each of us had missed out on! For those of us who find ourselves too busy to learn new things during our day jobs, the tutorials and workshops provided an excellent opportunity to learn new skills in a short amount of time. Sebastien Binet gave an excellent session on the Go programming language. He gave a really good introduction and had obviously spent a lot of time creating the material. “Be a Happy RSE”, a workshop led by Microsoft’s Samin Ishtiaq, provided an excellent opportunity to reflect on how to get the most out of a challenging, but ultimately rewarding role. It also gave people space to think, and talk, about their career paths - a timely topic for many attendees! The conference also played a fitting home to the UK RSE Network’s Annual General Meeting. The stewardship of our network was handed from one pair of co-chairs and committee members to the next. The accomplishments of the previous committee are significant: an identity for RSEs, an established community, EPSRC funded fellowships and a successful conference. The task of following could feel daunting, and one would think it might be tempting to rest on the gained success. This couldn’t be further from the truth. The new committee are ambitious and hungry for further progress. They are Alys Brett, Christopher Woods, Mark Turner, Robert Haines, Mihaela Duta, Matthew Johnson, Illian Todorov, Hannes Loeffler and Simon Hettrick. The new chairs, Alys Brett and Christopher Woods, outlined four themes for the Network to focus on diversity, training, policy and communications. The participants of the Annual General Meeting formed groups to discuss these topics. Some of the discussion groups had only scratched the surface by the end of the discussion time. The diversity of our community is poor: less than 18% of participants reported their gender as female, and more than 95% identified as white. The members of the diversity group reported that there were similar problems at their institutions. There are no simple answers to this systemic problem. Recruitment practices were highlighted as a starting point; replacing interviews with longer assessment periods (e.g. internships). A later talk by Athina Frantzana suggested that training may also be important. One of the key results of the communication group’s discussion is that the RSE Network will start to make greater use of Slack. Announcements will be made via the email mailing list, discussions will be held on Slack, and sub-channels will be used to focus on particular topics. Those who participated in the discussion groups were definitely enthusiastic to continue the work. The training group discussed primarily what types of materials should be developed and provided through the UK RSE website. While the organisation has historically tried to raise awareness and advocate for the application of software engineering principles to the development of research code, it has stopped short of issuing specific recommendations. Many people who attended this session expressed a desire for the organisation to take a stronger stance on this matter and to develop and publish a code of software practice that would make some concrete recommendations about what constitutes good practice (e.g., use of version control) vs. bad practice in software development. This was certainly a memorable conference. Two hundred people assembled in Manchester in September 2016 for the first Research Software Engineers Conference, and they were treated to a varied and interesting program. Presenters at the conference have been asked to submit a paper to a special edition of Journal of Open Research Software - look out for these towards the end of the year. Next year’s conference has provisional dates of 7-8 September 2017 and will be held in Manchester. 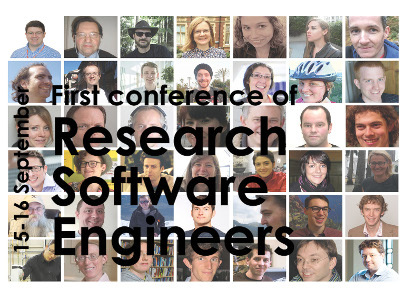 We look forward to the next Research Software Engineers Conference!